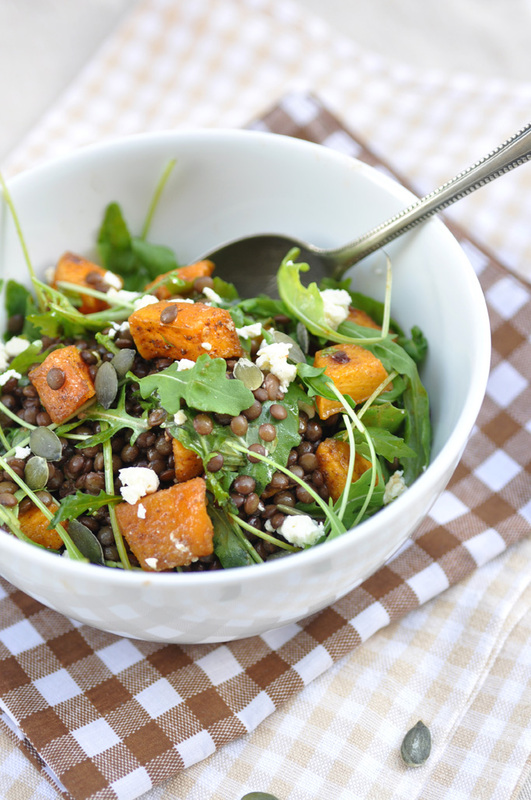 Lentils are the perfect autumn/winter food, don't you think? Comforting, warming and filling and very versatile when it comes to its usage in a dish. I bookmark almost every lentil recipe that I come across. I have the whole array of lentils in my pantry. Yet, I hardly ever get to make one of these recipes. My lentil bags in the pantry are mostly untouched. God knows why. To be honest, only red lentils I use on a regular basis for soups and dals. I am hoping that this will change in the coming weeks and months when it's cooler. A good start were the Lentil Pancakes that I posted a few weeks ago. Today's salad is a good follow-up recipe, as it couldn't be any more autumn-y. Roasted pumpkin seasoned with cumin, paprika and chili flakes with black lentils. Arugula adds some more earthy freshness, and little feta cheese crumbs add some creaminess. So many layers of textures and flavors in one single bowl. Enjoy! Soak lentils in cold water for a few hours. Drain. Cook lentils in boiling salted water until tender, but still with a bite, around 20 minutes. Drain and set aside. Toss pumpkin cubes with 1 tablespoon of olive oil, spices and salt. Place pumpkin on a baking tray in a single layer and roast until tender, about 20 minutes. Turn over halfway. Set aside. Mix two tablespoons of olive oil with lemon juice. Transfer lentils to a serving bowl. Stir in the lemon dressing. Add pumpkin cubes and arugula leaves. Sprinkle with feta cheese. Ready to serve.